Charles Darwin's very radical ideas on the structure of the living world transformed biology from a collection of curious but disconnected facts into a vigorous and unified science. His theory of evolution by natural selection originated during a five-year voyage around the world as a naturalist on board HMS Beagle under the command of captain Robert FitzRoy. The voyage had three missions, two official and one unofficial. The official missions were to map the east and west coasts of South America, and to complete a series of chronometric readings while circumnavigating the globe. The chronometric readings are related to the the way in which navigators determine longitude. If a sailor knows what local time corresponds to noon Greenwich time, then he simply takes a sighting on the angle of the sun, knowing that at noon, the sun is directly overhead in Greenwich. It is then a simple calculation to determine how many degrees he has travelled from Greenwich. The unofficial mission was to repatriate three Tierra del Fuegian natives captured by FitzRoy during the previous voyage of the Beagle. Fuegians were normally hostile to shipwrecked sailors and FitzRoy hoped that by educating these captives and teaching them English manners, they would ultimately convert their countrymen to developing a friendly attitude towards sailors. FitzRoy was terrified of the lonliness and isolation that he would face as captain (the captain on the previous voyage, on which FitzRoy was first mate, committed suicide, and FitzRoy himself was emotionally high-strung and mentally unstable). As captain of an English ship, he would be restricted from any close relationships with his crew. He therefore hit upon the idea of inviting a gentleman of appropriate social standing to be his guest and companion. In return, the companion would have a rare opportunity to visit exotic locales and see new and wonderous sights. The position was offered to the naturalist and clergyman Leonard Jenyns, who declined because of his parish responsibilities. Jenyns recommended John Henslow, a famed botanist and clergyman, who declined because of his family situation. Henslow, who was also Darwin's friend and mentor, recommended Darwin as the best qualified person who would be likely to accept. Darwin's father, Robert, was most unhappy about the situation and forbade him from accepting the offer. But he did leave an out by saying that if Charles could find one reasonable man to convince him otherwise, then he would allow Charles to go. Darwin enlisted the aid of his uncle, Josiah Wedgewood, and finally received his father's blessing. The Beagle departed on 27 December 1831 on what was meant to have been a three-year voyage, and returned on 2 October 1836. 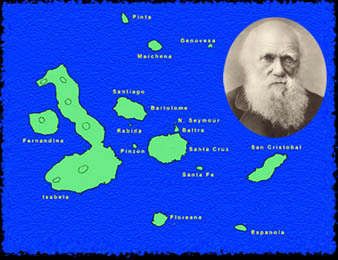 On 16 September 1835 the Beagle reached the Galapagos Archipelago, a cluster of islands on the equator 600 miles west of South America. During his five weeks in the Galapagos, Darwin found the giant tortoises that differed from one another so greatly that anybody with half an eye could immediately say which island they came from. Two forms of iguanas lived in the islands. Each type had affinities with the common South American green iguana, yet they had adapted so profoundly to different ecologic niches in the islands that they had evolved into separate genera. Conolophus, adept at living on the arid islands and feeding on the sharp-spined Opuntia cactus became the land iguana, while Amblyrhynchus, with its flattened tail for swimming, its strong claws for hauling itself out on the water, and its blunt, shortened snout for scraping algae off of rocks, became the marine iguana. Moreover, many islands developed their own races of these unusual lizards. Many of the birds that Darwin found, especially the land birds, were endemic species found nowhere else on earth. Here were thirteen different types of finches whose beeks were modified to different sub-environments on the islands. The Galapagos islands were volcanic in nature and relatively recently formed, Darwin reasoned, and the animals that dwelt there had to have come from someplace else. Those most closely resembling the Galapagos community were the animals that lived closest to the islands on the mainland. But they were not the same animals. Why? "If there is the slightest foundation for evolution, the zoology of the Galapagos will be well worth examining..."